The land around the Jordan River Valley and the Dead Sea plain is revered by Muslims, Christians and Jews as blessed. The Bible calls it “the Garden of the Lord” (Genesis 13:10). 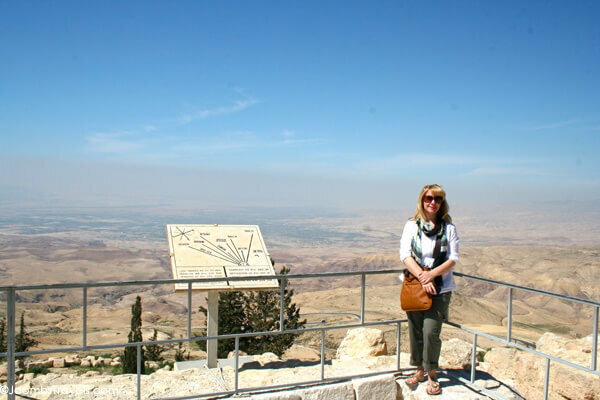 Our own visit to the Holy Lands brought us to Madaba, Mount Nebo, and Bethany-beyond-the-Jordan. Best known for its spectacular Byzantine and Umayyad mosaics, Madaba is home to the famous 6th century Mosaic Map of Jerusalem and the Holy Land. With two million pieces of vividly colored local stone, it depicts hills and valleys, villages and towns as far as the Nile Delta. 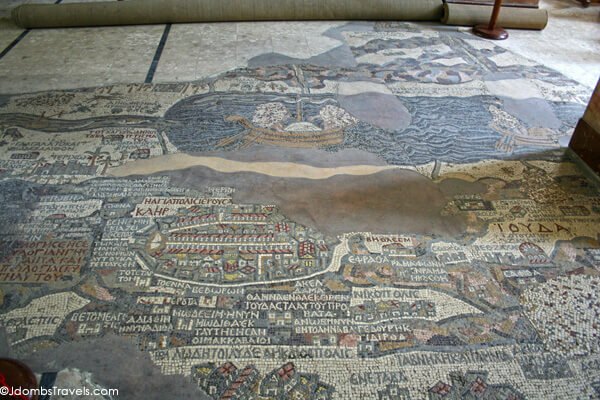 The Madaba Mosaic Map covers the floor of the Greek Orthodox Church of St. George. The church was built in 1896 AD, over the remains of a much earlier 6th century Byzantine church. 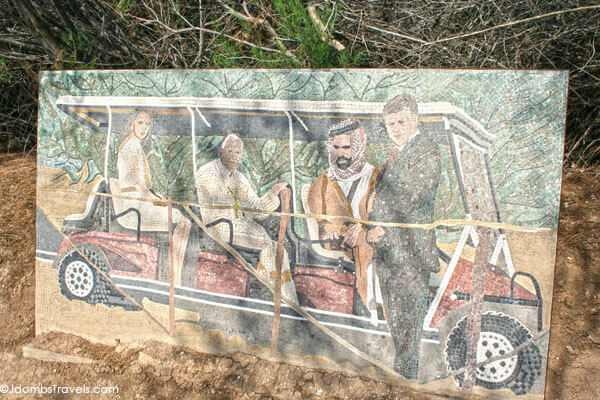 The mosaic represents the biblical land from Egypt to Lebanon, including Sinai, Israel, Palestine and Transjordan. The Madaba Mosaic Map is deemed by scholars to be one of the best topographical representations of the Biblical Lands before modern cartography. 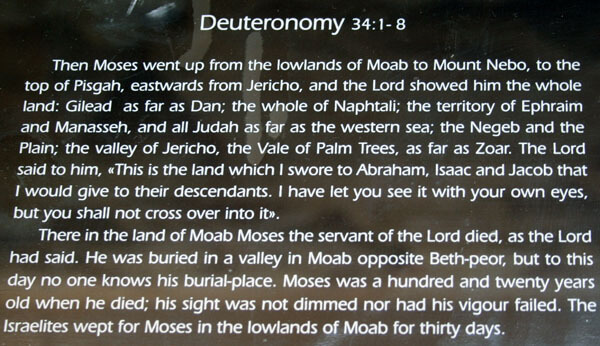 As a source of biblical topography the map is fully comparable with the well-known treatise on the biblical places written in Greek around 395 AD by the historian Eusebius of Caesarea and translated into Latin by Jerome around 490 AD. The original mosaic would have covered about 94 square meters, but only about 25 square meters are still preserved. A total of 156 biblical memoirs are depicted in the preserved portion of the map. After visiting the Madaba Mosaic Map, stroll around the city center. There are some ruins at the Archeological Museum and many shops sell handmade mosaics. Our next stop after Madaba was Mount Nebo. According to ancient tradition, this is the mountain from which Moses saw the Promised Land before he died. Elements of a triple-apse Byzantine basilica were uncovered by archaeologists in the 1930s, and have been incorporated into the structure of the modern church building, known as the Memorial Church of Moses. On March 20, 2000,the late Pope John Paul II visited the site during his pilgrimage to the Holy Land and during his visit he planted an olive tree beside the Byzantine chapel as a symbol of peace. Although the identification is not absolutely certain, archaeology has shown that the area known as Wadi Kharrar has long been believed to be the biblical Bethany-beyond-the-Jordan, where John the Baptist lived and Jesus was baptized. The Baptism Site on the Jordan side of the Jordan River is one of the most important recent discoveries in biblical archaeology. Excavations only began here in 1996, following Jordan’s peace treaty with Israel in 1994, but have already uncovered more than 20 churches, caves and baptismal pools dating from the Roman and Byzantine periods. A visit to the Baptism site begins with a walk along a foot path. The change in the environment is dramatic and it becomes clear why the Prophet Jeremiah described it as “the jungle of the Jordan” (Jer. 49:19). The dry desert transforms into a tropical climate as the paths lead into a thicket of reeds and tamarisk bushes. The air is filled with sounds: bird-songs, buzzing insects, and the sound of running water from the springs.The path leads into a clearing marked by a pool and the ruins of the 7th-century Church of John the Baptist. On March 21, 2000 the late Pope John Paul II visited the Baptism Site and a mosaic depicts his visit. Continuing along the foot path through the tamarisks, is the River Jordan itself. The opposite bank is Israel, where a small 1950s chapel and copious fences with military presence can be seen. Dip your hands in the River Jordan and bless yourself with the holiest of Holy Water. 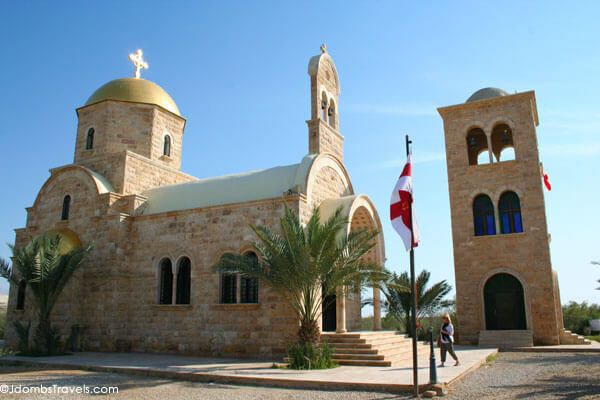 A modern Orthodox church dedicated to St. John the Baptist has been built next to the Jordan River as part of the development of the site. The small church has a golden dome and is painted with Byzantine-style murals inside.